And that settled the decision. So we went on our way as people were freaking out and driving like maniacs (all caution goes out the door @ the sign of a storm and riot mode takes over… geesh!) 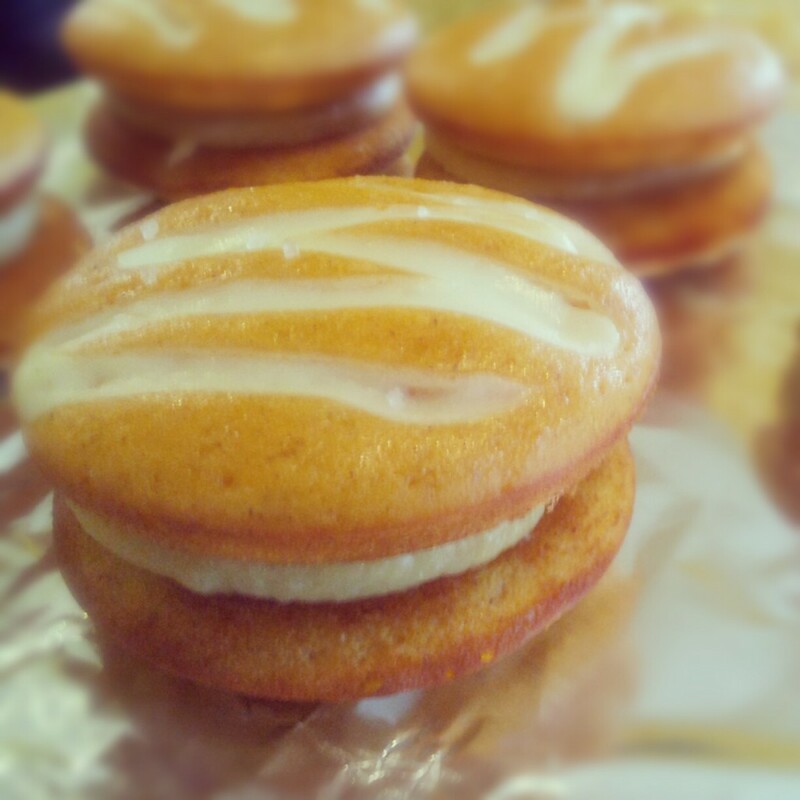 and I finally decided to make 2 pumpkin items: the equivalent of a Boston cream pie but with PUMPKIN… and pumpkin and cream cheese whoopie pies. 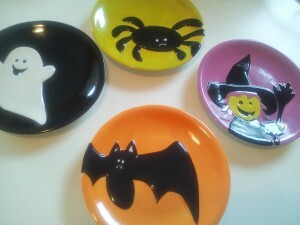 Halloween plates. The spider and the bat look so sad… they’re the cutest ones! I made a vanilla cake batter with pumpkin puree and cinnamon and baked a couple small fillable cakes. There was extra batter so I baked a tray of mini cupcake wrappers. While these cakes cooled, I stood over the stove to make pumpkin spiced pudding (to substitute as the vanilla cream filling) and a brown sugar and cinnamon caramel glaze (instead of the chocolate ganache topping). I had these Halloween themed plates (I won a pumpkin carving contest a couple years ago after spending almost 5 hours making the Death Star and these were my prize) and little mummy and witch figures and thought, “Hey, why not make this Halloween-y?” Uhh, the assembly wasn’t as pretty as I had hoped, but it tasted delicious. 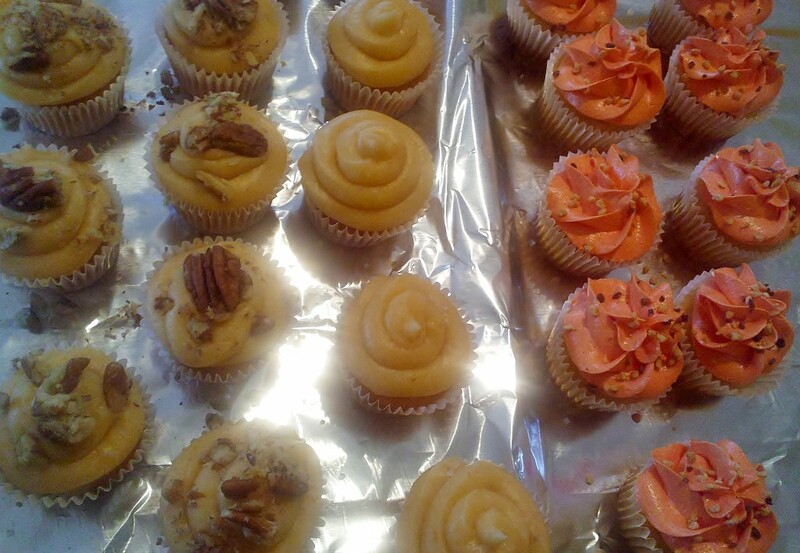 I whipped up some orange frosting for the mini cupcakes and sprinkled some crunchy toffee pieces on them. For the whoopie pies, I added pumpkin puree to a light angel food cake batter and scooped it out onto this whoopie pie pan Vin got me last Christmas. 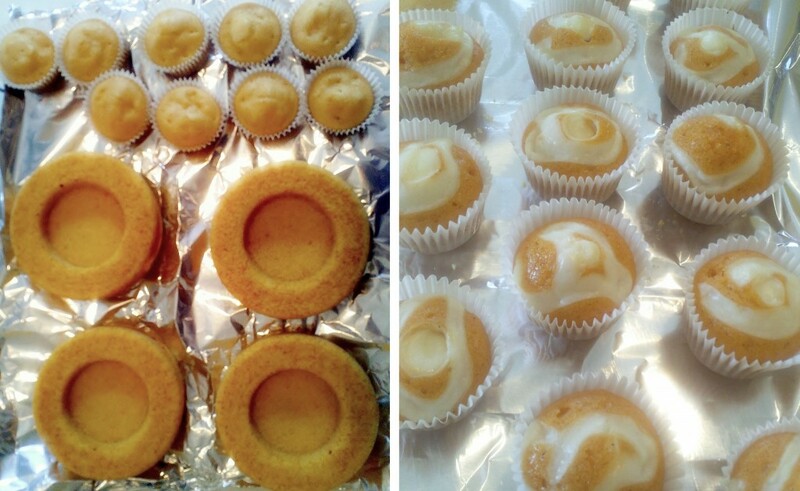 I added a sweetened cream cheese zigzag topping and popped the tray in the oven and then piped the extra batter and extra cream cheese into mini cupcake wrappers. For the filling, I whipped up a pumpkin-cream cheese-caramel frosting and it went perfectly with the cake. I was worried it would be too sweet, but the cake part balanced it out, and I smashed up pecans to add to the pies. 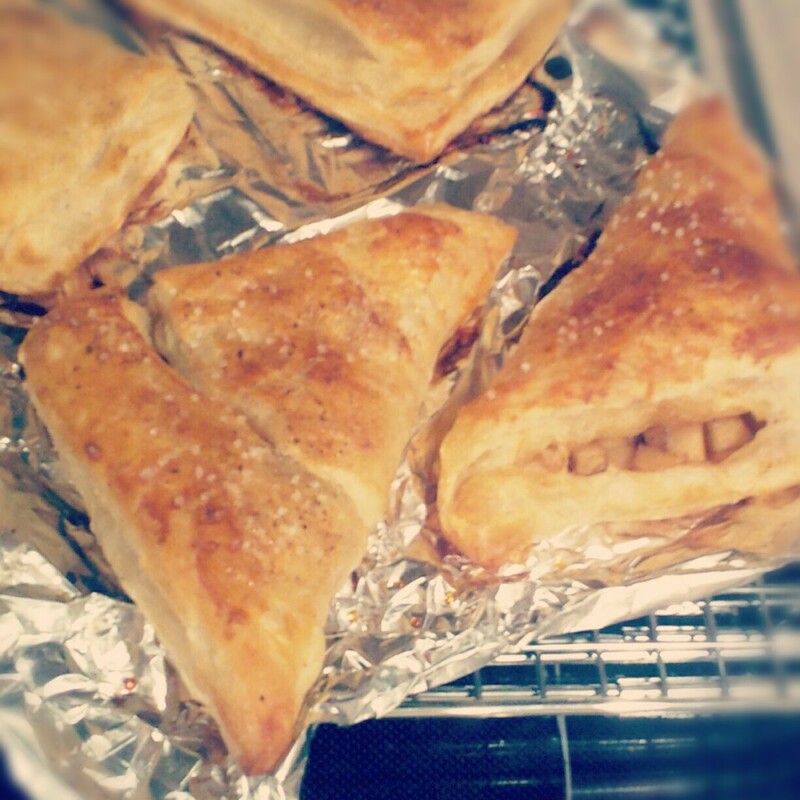 They looked pretty awesome, in my humble opinion =) I topped the minis with the extra frosting and crushed pecans. This experimental combination tasted REALLY good. When I came into work the following Tuesday, people shared their war stories and some of the tales were heart wrenching. I mean, we didn’t have electricity for a week and our fence was destroyed and there was some damage to the roof, but that was nothing in comparison to what so many other people lost. And it was one of those situations where I just listened and all I could do was say, “Oh my God… I’m so sorry… Oh my God…” over and over. As soon as we got power, Vin and I turned on the lights in the basement and sorted out warm clothes and coats and extra non-perishables we could donate. As soon as the supermarkets were restocked with fresh food, I wanted to restock our fridge with the basics and bake something for coworkers that lost so much more. 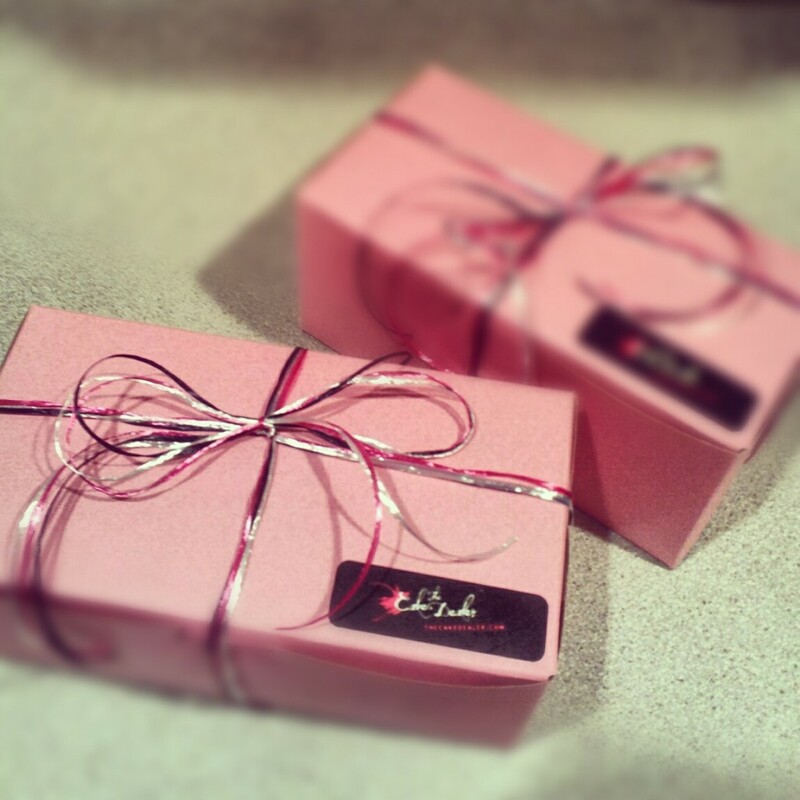 I quickly made some mini blueberry muffins for a couple coworkers and packaged them properly in pink boxes with signature ribbon and Cake Dealer labels. Admittedly, they weren’t my best offering, but I just wanted to give something to try to cheer them up. When I gave the care packages to a friend that had to flee from her apartment in Coney Island and another coworker that lost her house and car in Long Beach, I got appreciative smiles and huge hugs… the best thank yous ever. To donate hurricane relief funds to the Red Cross, click here.